We keep one of the North of England's most comprehensive inventories of sports shooting equipment for hire. 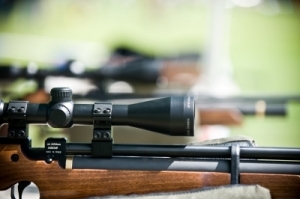 In addition to the shooting equipment and ancillaries, we can supply you with trained technicians and coaches, the right insurance and the organisational know-how to make sure you get what you want in the quantity you need. We're more than happy to cater for the needs of a small gathering of friends or colleagues, but we can also supply a 500 gun event if that's what you have in mind. Not everyone will be familiar with the descriptions and manufacturer's names we detail below, but those who are will know that we are supplying trusted brands of excellent quality. 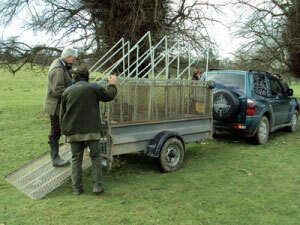 We can supply shooting sports equipment for use at any location in the UK. Almost any all-day outdoor event needs some provision for bad weather or, should you be fortunate, a place to get away from strong afternoon sunshine. 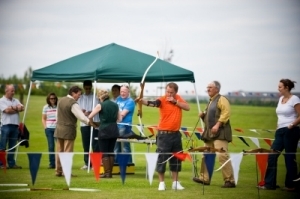 We have a range of gazebos suitable for shooting events and can supply marquees to order. It is possible that other suppliers may not have a sufficient quantity of the rope boundary fences and other safety equipment, or be unfamiliar with the specialised requirements of a shooting event. 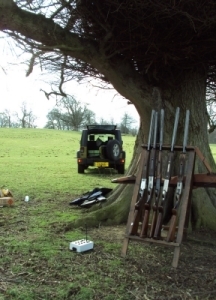 If you hire your tented accommodation and ancillaries from us, you will see it arrive with the rest of the equipment, have it set up first thing, and know that it is positioned properly for a shooting event or whatever other requirements you have. Our prices are competitive with those of most other suppliers. To stage a clay shooting event for friends, or the general public, it is not sufficient to have a range of well-maintained shotguns to suit people of different statures, ages and abilities - although of course, we have those. Alongside all the signage, safety equipment, shooting cages, safe storage and outdoor furniture that you could need we have a great range of shotguns for you and your guests to try. Do you see yourself shooting with a gun that would grace the arm of a country gent? Maybe you'd prefer a pump-action tool, a bit more 'Del Boy'? The equipment is ours but the choice is yours. Quality is one thing we deliver on, but you may also need quantity. With one of the largest inventories of traps available in the north of England (including some of the latest Bowman models), we can cater for the needs of even the largest events. Our stock includes rabbit traps, oscillators and looping traps, and we now have wireless Simulated Game remote trap control available too. If you need it for your clay shooting event, we've probably got it - and we can also supply the qualified technicians to operate it for you. 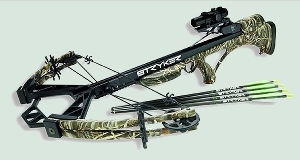 We have the fullest possible range of bows available, suitable for people of all ages, builds and abilities. We have compound bows, recurve bows, children's bows... and can even supply you with a medieval longbow. Naturally, we are also able to supply the necessary safety equipment (such as forearm protection), targets, shielding fences, arrows, bow stands and ancillary equipment. If you tell us who you are looking to hire archery equipment for, we will be able to advise you on the best and most cost-effective solutions. We have the latest in pre-charged air powered rifles available for hire: Air Arms S200s and Brocock Hunter .22s. 'Pre-charged' means that you don't need to pump the guns up between shots - they are powered by a compressed air or gas canister. The Air Arms S200 is renowned for combining light weight with accuracy, an accuracy which can be further improved with one of our telescopic sights fitted. Offering slightly different dimensions and fit, the well-rated Brocock Hunters are popular for much the same reasons. Our CO2 powered air pistols are also available for hire. We can supply suitable pellets, darts or other projectiles and as many targets as you need. 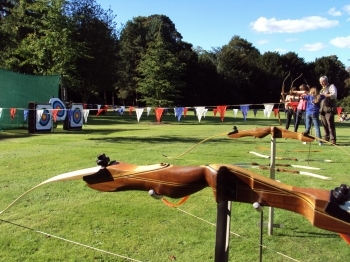 There aren't many places you can hire several hunting or target catapults, but we are one of them! 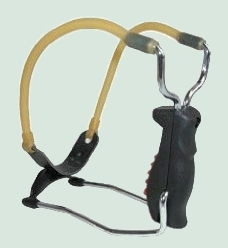 We have the 'original and best' Barnett Black Widows for hire, together with all the necessary safety equipment. Call for prices and availablity. Indulge your inner William Tell with the modern equivalent, which is a high-powered composite recurve bow capable of delivering a bolt accurately to a target that could be well over 50m away. All our crossbows are superbly maintained for optimum power and accuracy. Call for prices.